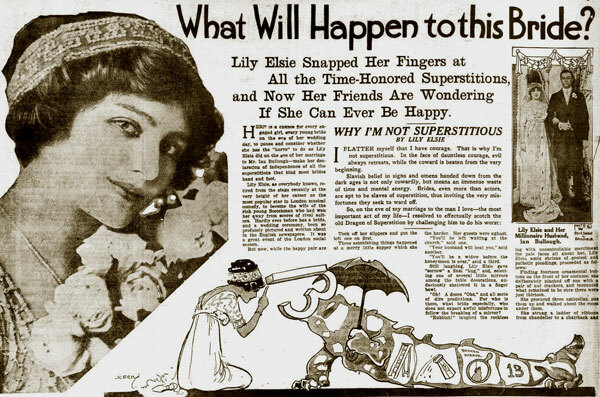 Just at the present moment Miss Lily Elsie is the toast of the gilded youth in London, and no actress is more popular. A careful estimate shows that she is the most photographed woman in the world. She has been called the “Guardsman’s Goddess” because the young officers in the King’s household regiments, most of them noblemen, are her admirers. Miss Elsie has kept her head unturned and looks upon her numerous lovelorn adorers as passing leaves upon the wind. for having been photographed more frequently than any actress ever on a London stage, and for having had more proposals of marriage. It is said that she has been photographed at least once every week day in the year. Even then the insatiable demands of the photographic firms were not satisfied. They could not obtain enough of her photographs to supply the enormous demand. 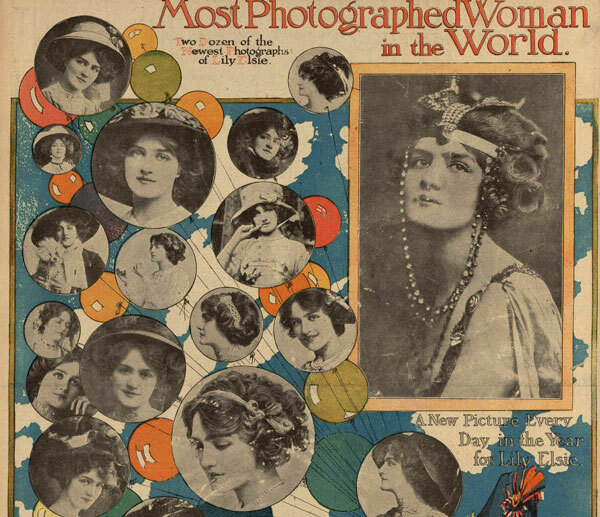 LADY DUFF-GORDON, the famous ‘Lucile’ of London, and foremost creator of fashions in the world write each week the fashion article for this newspaper, presenting all that is newest and best in styles for the well dressed woman. Lady Duff-Gordon’s Paris establishment brings her into close touch with that centre of fashion. Lady Duff-Gordon’s American establishment is at No 17 West Thirty-sixth Street, new York City. 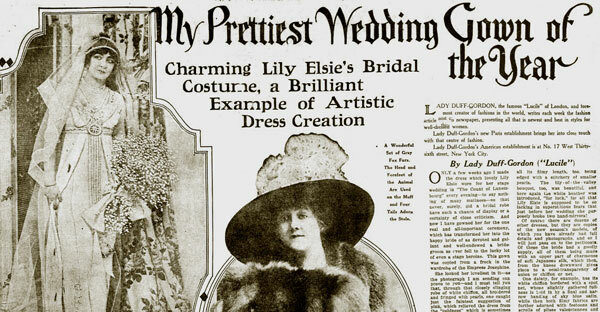 Only a few weeks ago I made the dress which lovely Lily Elsie wore for her stage wedding in ‘the Count of Luxemburg’ every evening – to say nothing of so many matinees, - so that never, surely, did a bridal robe have such a chance of display or a certainly of close criticism. And now I have gowned her for the one real an all-important ceremony, which has transformed her into the happy bride of a devoted and gallant and well-endowed bridegroom as ever fell to the lucky lot of even a stage heroine. This gown was copied from a frock in the wardrobe of the Empress Josephine. These three articles are all from the U.S.A. - distributed by the Hearst Features Syndicate to about two dozen major newspapers nationwide. These scans are from the Chicago Examiner. We are hugely indebted to Randy B from the USA for sending us these scans.